It’s odd, that I’ll list barbecue sauce as a possible bereave from the snot onslaught (heh), but I did at least breathe a bit better from my nose for at least 30 minutes. Thanks Rib in a Cup! Almost everything on its menu as a version of Mac and cheese (like waffles? 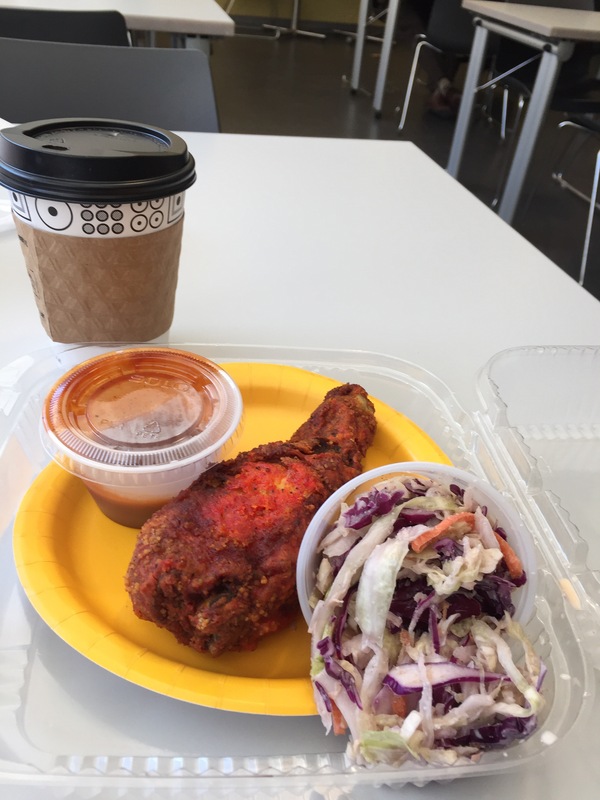 ), so this was the only thing I could eat, sans the pork and the Mac products: Fried chicken in a cup ($3) and a side of coleslaw ($1) = $4. I pick up the chicken leg; I can tell it has great heft and skin crunch, even before I take my first bite. It’s covered with a red topping for the skin; I can’t tell what it’s made of, but its crunch was great, the taste was savory, and the chicken was very tender, very pull-away from the bones, very flavorful. The coleslaw was good, it was not soupy, but it looked like it was made in only 10 seconds, before it was left behind at the kitchen table for several hours. Good taste, but it wasn’t too clean on the palette. The hot chocolate at the Doughnut Plant, made with almond milk and Valrhona chocolate was divine, at $4.84. Back to the dusty 10-inch reels. It was good to dream and remember old times for a while.